The frequency of the storms is somewhat correlated with Sun-spot activity, since flares are usually associated with Sun spots [Haymes, 1971]. Thus, a storm may recur after 27 days (the length of a solar rotation) and the overall activity tends to follow the 11-year solar cycle. Storms are also more frequent near the equinoxes, possibly because at approximately those times, the position of the Earth is at the highest solar latitude (about 7 deg). Sun spots appear most frequently between the solar latitudes of 5 deg and 40 deg on both sides of the equator. They appear first at the higher solar latitudes at the beginning of a solar cycle. where B is the magnitude of the interplanetary field in nT [Haymes, 1971]. The Sun is also responsible for the diurnal variation of the geomagnetic field. Solar electromagnetic radiation ionizes some atmospheric atoms and molecules at an altitude of roughly 100 km, producing the E-layer of the ionosphere. The Sun'i gravitational field then exerts a tidal force causing the ions and electrons to rise. The interaction of the charged particles with the geomagnetic field produces a rather complex current system which creates a magnetic field. The effect is most pronounced on the day side of the Earth, since it is dependent on the ion density of the E-layer. 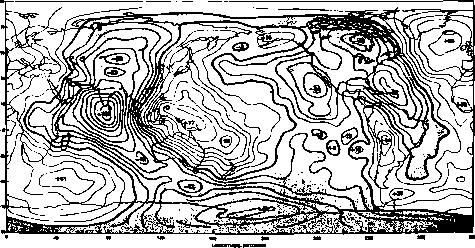 On solar quiet days, this field causes a deviation from the internal field of 20-40 nT in the middle latitude regions and can cause deviations of 100-200 nT near the magnetic equator [Harris and Lyle, 1969]. At each magnetic observatory, the daily magnetic variations for the five quietest days are averaged together to produce the quiet day solar variation, S . This variation is subtracted from the actual variations before generating Kp. The Moon also exerts daily tidal forces which lead to quiet-day variations about 1 /30 of that due to the Sun [Harris and Lyle, 1969]. There are two other current systems of some importance: the polar electrojet and the equatorial electrojet. The polar electrojet is an intense ionospheric current that flows westward at an altitude about 100 km in the auroral zone. 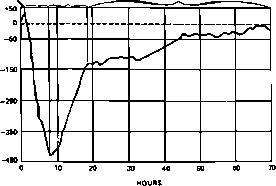 Changes in the electrojet can cause negative excursions (called bays) as great as 2000 nT and are typically about 1000 to 1500 nT at the Earth's surface. The excursions can last from 0.5 to 2 hours. Like magnetic storms, auroral activity has a 27-day periodicity and reaches a maximum at the equinox« [Harris and Lyle, 1969]. The equatorial electrojet is an intense west-to-east current in the sunlit ionosphere. It is partly responsible for the high intensity of the magnetic storms. It produces a 220 nT discontinuity in the total field between 96- and 130-km altitude. At 400 km, the field is 30 to 40 nT at longitudes across South America and 10 to 20 nT elsewhere [Zmuda, 1973]. where r is the unit vector from the Earth's center to the body (assumed to be a point mass). A gravitational potential satisfying Eq. (5-14) may always be found due to the conservative nature of the gravitational field. Here, R& is the radius of the Earth, Jn are zonal harmonic coefficients, Pn m are Legendre polynomials, and Cnm and are tesseral harmonic coefficients for nj>m and sectoral harmonic coefficients for n = m (see Appendix G). 'Note that the n=0 term is written explicitly in Eq. (5-18) as--—, and that the n = 1 term is absent due to the origin of the coordinate system being coincident with the Earth's center of mass. The zonal harmonics are a major cause of perturbations for Earth-orbiting spacecraft, being the primary source of changes in orbital period, longitude of the ascending node, and argument of perigee (Section 3.4). The gravitational potential of Eq. (5-18), when combined with the potential due to the angular momentum of the Earth's rotation, describes a mathematical model or reference figure for the shape of the Earth, known as the geoid or mean sea level. The geoid is a surface coincident with the average sea level (i.e., less meteorological and tidal effects) over the globe or in an imaginary channel cut in the continents. 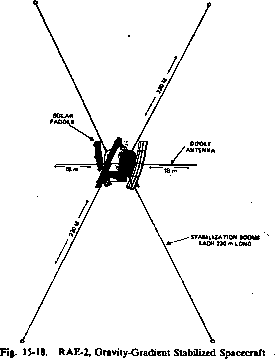 A number of measurement techniques have been used [King-Hele, 1976] to map the geoid, including satellite-to-satellite tracking, in which a geosynchronous satellite measures the relative velocity of a lower orbiting satellite; radar altimetry from satellites; and laser ranging to reflectors both on satellites and the Moon. The last method has been the most accurate. Fig. 5-8. Geoid Heights From Goddard Earth Model-8 (GEM-8). Contours fire at 10-m intervals. (From Wagner, et aU ). spheroid of flattening 1/298.255 and semimajor axis of 6378.145 km* as given by the Goddard Earth Model-8 (GEM-8) [Wagner, et al., 1976]. Particularly noticeable is the variation from 77 m above the geoid near New Guinea to 105 m below in the Indian Ocean. The accuracy of the potential function, i.e., the number of terms included in the infinite spherical harmonic series, has a greater effect on orbital dynamics than on attitude dynamics. For analysis of gravity-gradient torques on spacecraft, inclusion of the J2 term in the harmonic series is normally sufficient because of the uncertainties in other environmental disturbance torques. For practical purposes, the point mass potential function, Eq. (5-14), is adequate for spinning satellites or those with only short appendages. Table 5-4 lists the differential acceleration, da/dr = -2ft/r\ experienced by these satellites for various altitudes.